The handwritten missive, sent in 1928 by Einstein from Berlin to a mathematician about the formalisation of the "Third Stage of the Theory of Relativity", was snapped up by an anonymous buyer for $103,700 (83,600 euros). Israel: A letter penned by legendary physicist Albert Einstein discussing one of his groundbreaking theories sold in Jerusalem Tuesday for over $100,000 as part of trove of documents that went under the hammer. 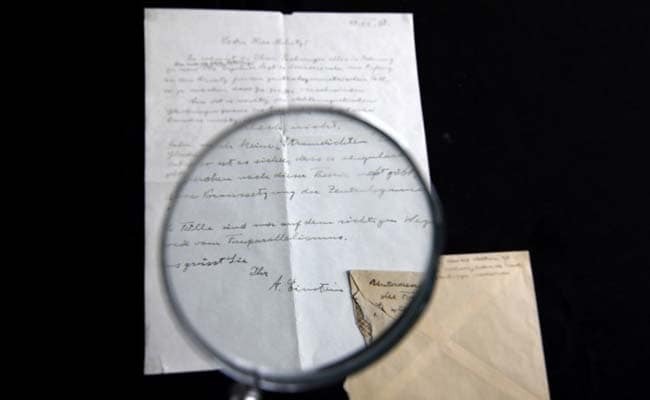 The letter was written during one of the "most exciting, feverish periods of Einstein's scientific career" as he worked to hammer out one of the major scientific breakthroughs of the last century, auction house Winner's said. The sum -- while large -- pales in comparison to the $1.56 million that one purchaser paid for a letter from Einstein on the secret of happiness at a Jerusalem auction in October after it was initially valued at some $8,000. Among Tuesday's other lots were letters and photographs relating to the winner of the 1921 Nobel Prize in physics that also sold for several thousand dollars. Winner's boss Gal Wiener told AFP that the trove "reveals the complex character of the great scientist".